Among all the precautions that a diabetic patient must observe, it has been recently found that wearing proper shoes is of equal importance as diabetes disrupts the blood flow in a human body and causes sores and cuts to heal considerably slowly. With the help of physicians and footwear professionals, diabetic patients are now able to avoid several serious foot complications as it helps in relieving the areas of excessive pressure, reducing shock and shear, accommodate and stabilize deformities, and limit the motion of joints. The prevalence of diabetes is undeniable, in fact the number of patients continues to surge annually. Consequently, the global market for diabetic shoes is estimated for a healthy CAGR of 8.1% during the forecast period of 2016 – 2024. According to the report, the opportunities in global diabetic shoes market was valued at US$5.0 bn, which is projected to reach US$9.9bn by 2024. This report on global diabetic market is a comprehensive study of the current scenario and the figurative estimations presented are based on several factors that are expected to influence the market during the forecast period. The report also profiles some of the key players currently active in the market, including their market share, product portfolio, and recent strategic developments. The report also segments the global diabetic shoes market on the basis of distribution channel, end use, and geography. According to recent estimations by the International Diabetes Federation (IDF), there were 415 million diabetic patients across the globe, and the number will reach 642 million by 2040. This vast population is the primary driver of the global diabetic shoes market. Currently, the market is expanding steadily due rising disposable income among the urban population, who are well aware of infections caused by weak blood flow in the foot, and are willing to invest to avoid the complications such as ulcers and gangrenes. Research and development for enhancement of these products is another factor that is propelling the market in positive direction, as newer products provide more comfort. Moreover, emphasis on innovation production quality on the formulation of new therapeutic shoes to improve performance is expected to impact the market for diabetic shoes globally. Furthermore, the report observes that diabetic shoes are gaining importance among the aged population across the globe. Geographically, the report studies the lucrativeness of regional diabetic shoes markets of North America, Europe, Asia Pacific, and rest of the world. 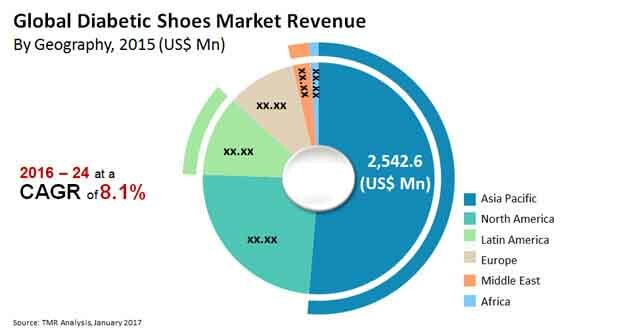 During the forecast period, Asia Pacific region is projected to witness the most prominent growth rate in the diabetic shoes market, with China being the most lucrative market in the region, followed by India. These two countries reside nearly one third of the world’s population. Rising geriatric population, growing economic condition, improving purchasing power and rising disposable income and rise in the per capita income are major factors that booming the demand of diabetic shoes in the Asia Pacific Furthermore, North America is projected to remain an attractive market for the diabetic footwear manufacturers. Aetrex Worldwide, Inc., Podartis Srl., Etonic Worldwide LLC, Dr. Comfort, LLC., Advance Diabetic Solution, Apex Foot Health Industries LLC, Dr Zen Products, Inc., DARCO International, Inc, Orthofeet Inc. and Drew Shoe Corporation. are some of the prominent companies currently operating in the global diabetic shoes market. Extensive research and development by these companies to introduce new diabetic shoes is expected to address the growing needs of consumers. Also, some of the local players offer diabetic shoes at an affordable price, and due to this affordability of this product coupled with increasing variety of the this footwear, diabetic patients have shown increased preference for more comfortable therapeutic shoes. Diabetes can be described as a disease, which is marked by high levels of blood glucose resulting from defects in insulin production and insulin action. The disease has become a global epidemic leading to serious complications and ultimately resulting in premature death. Diabetes affects several organs of the body including eyes, kidneys, heart. However, it has been observed that the feet in particular are affected due to damage done to the nerves without immediate/early detection. People suffering from diabetes suffer from feet ulceration that results are usually associated with high treatment expenses. The global diabetic shoes market is expected to witness a steady growth during the forecast period due to the increasing incidence of diabetes globally. Rising skin related problems in the feet due to diabetes is another reason that is triggering the demand for diabetic shoes. The physicians prescribe diabetic footwear to the patients suffering from diabetes in order to prevent all feet related complications. Owing to high level of comfort and convenience of wearing the diabetic shoes, the global market is expected to grow steadily throughout the forecast period. Later on, it was seen that foot has become a complex biomechanical and anatomical structure. Therefore, a complete study of the feet was essential in order to make a diabetic shoe in order to prevent the foot injury. Therapeutic or diabetic shoes are specifically designed to reduce the problems in the feet of the person suffering from diabetes. Diabetes create changes in the skin of the foot due to the damaged nerves, which are no longer functional and prevents moisture and oil secretions. Increasing awareness about the presence of diabetic shoes in the market and the increasing need to lead a healthy lifestyle is one of the key factors propelling the growth of the diabetic shoes market across the globe. Diabetic footwear is prescribed by physicians to reduce the complications of a person suffering from diabetes. The consumers must be aware that the diabetic shoe matches the size of the foot and also the shoe has enough room for the toes at the sides and front as well as the top so that the pressure of the shoe are not felt. People with diabetes are highly prone to disrupted blood circulation to the foot resulting due to nerve damage. Disrupted blood circulation results to loss of sensation in the foot, thus causing wounds or ulcers that take a fair amount of time to heal. However, lack of awareness among the consumers regarding the benefits of diabetic shoes is restraining the global diabetic shoes market. Moreover, increasing brand presence and roles of e-commerce are generating opportunities to the diabetic shoes market in recent years and this growth is expected to boost the global diabetic shoes market during the forecast period. However, diabetic shoes, although act as a convenience for the patients suffering from diabetes, they however, does not help reduce the same. Diabetic shoes are used to comfort the consumers inducing proper blood circulation compared to a patient wearing a regular shoe. Consumers largely resort to the consumption of medicines for treating diabetes and various other alternatives, which is why a large portion of the diabetic population refrain themselves from purchasing diabetic shoes, which in turn is a major factor hindering the growth of the diabetic shoes market at present. Moreover, the price of diabetic shoes are on the higher end which another reason that is refraining the consumers falling in the low and middle income category from purchasing diabetic shoes. This is another reason for the consumers to stick to medicinal treatment and related treatments instead of diabetic shoes. However, with rising awareness, the impact of this restraint is expected reduce during the forecast period. Moreover, in this report the study provides different countries included in different regions such as North America, Europe, Asia Pacific, Latin America and Middle East and Africa. North America includes the U.S. and Rest of North America. U.K., Germany, Russia, Italy, France and Rest of Europe included in Europe. China, India, Japan and Rest of Asia Pacific included in Asia Pacific diabetic shoes market. In addition, Middle East includes country such as UAE, Saudi Arabia, Qatar, Kuwait, Oman and Rest of Middle East. Africa includes South Africa and Rest of Africa. Latin America comprise of countries such as Brazil and Rest of Latin America. In order to get a better understanding of the global diabetic shoes market, a key trends analysis has been included for all the segments. In addition, the market players in the diabetic shoes market have also been profiled. The leading players in the market include. Aetrex Worldwide, Inc. (New Jersey, US State), PodartisSrl. (Montebelluna, Italy), Etonic Worldwide LLC (New York, U.S), Dr. Comfort, LLC. (Wisconsin, U.S.), Advance Diabetic Solution (Georgia, U.S.A), Apex Foot Health Industries LLC ( New York, U.S.A), Dr Zen Products, Inc. (Florida, U.S.A.), DARCO International, Inc (West Virginia, U.S.A), Orthofeet Inc.( New Jersey, U.S.A.) and Drew Shoe Corporation. (Ohio, U.S.A ) among others.